The main characters of the show. From left to right: Ramurin, Torippii, Shimajiro, and Mimirin. 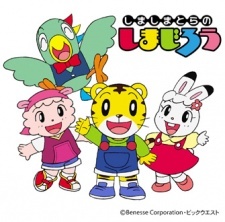 Shima Shima Tora no Shimajiro (The Island of Shimajiro the Tiger) is an educational children's anime made by Benesse. It follows the adventures of Shimajiro and his friends as they discover Challenge Island. The show is most notorious for its toilet-training videos, which reached a memetic status in America and were shown on the talk show The Soup. The series began in 1993 and has since spawned three sequels. It's one of the most popular anime franchises for young children in Japan. Many people believed that this series had received an English dub. A commenter on a video now deleted by Benesse claimed that he had a few episodes in English on VHS as a kid. Additonally, a closed GeoCities The Preschool Port (about non-PBS preschool shows from the 1980s and 1990s) said that the dub was apparently produced by CINAR, the creators of popular Canadian preschool shows such as Caillou and The Busy World of Richard Scary, who had previously dubbed the anime Koala Boy Kokki (The Adventures of the Little Koala) for Nick Jr, and was slated to air on The CBS Kidshow in the late 1990s after being pitched to The Fox Cubhouse and syndication, but was dropped for unknown reasons. According to Preschool Port, the dub changed the name to "The Adventures of Shimajiro". The dub kept the main characters' names, but the adults' names were changed to Mr./Mrs followed by the species name except for Shimajiro's teacher and changed Challenge Island to Animal Island. It was unknown how many English episodes were made, how many aired on television and/or went to VHS and what channels it aired on, as said VHS tapes were an extremely difficult find. A Yahoo Answers thread suggested the VHS in question is a bootleg, with voices dubbed over the original Japanese audio. However, an LMW user spoke with representatives from Benesse, who confirmed that they never licensed the Shimajiro property to any English speaking company. This means that the series was never dubbed into English. They did, however, dub two episodes of the most recent series in the Shimajiro franchise, Shimajiro no Wow in English, with the hopes of being able to license the property in the United States.